The day Angela Thomas sold the only thing she had, the diamond from her engagement ring, to take care of her kids was the day she began to believe they were going to make it. In that decision, the faith she had always talked about became the faith she was going to learn how to live. In the years since, God has given Angela a passionate desire . . . to live an amazing life, even while raising four kids as a single mom. 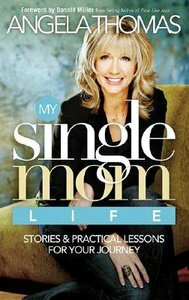 In this book she shares her hard-earned wisdom on loneliness, dating, finances, and parenting, encouraging every solo mom. "As a gift to our children," she says, "we can become healthy moms who are strong and amazing women in spite of our circumstances." About "My Single Mom Life"
Angela is an ordinary mom, with an extraordinary passion for God. She's been honoured to walk alongside women of all ages and walks of life through her books and speaking engagements. Angela received her Master's degree from Dallas Theological Seminary. She lives in Knoxville.- Publisher.